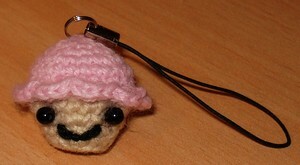 My two new babies : a pink jellyfish to go with the white one, and a cupcake. 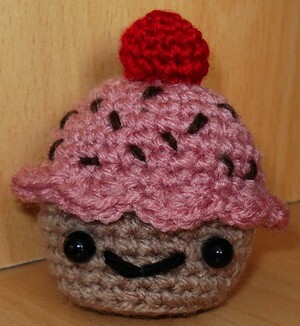 The base for the cupcake was done ages ago, but it got hidden in one of my craft bags. I just added eyes, mouth, sprinkles and the cherry ! Bring back the doggies ! I'm reading Princess Jellyfish at the moment. It's a manga (Japanese graphic novel) about a girl with a passion for jellyfish. 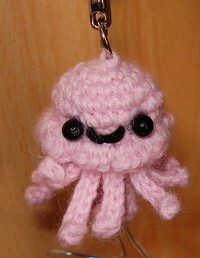 And so I decided to make a little jellyfish of my own. 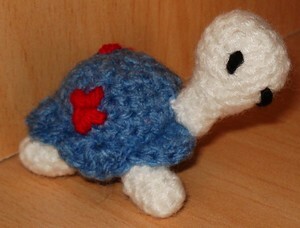 It doesn't look like the mascot in the book, but it's just because I wanted to just create as I went. 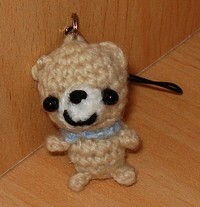 It's about half the size of the picture (3-4 cm), so I will attach a keyring link on top of its head. 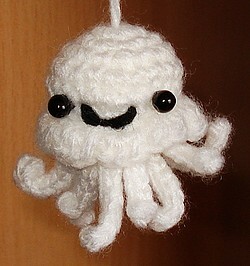 The head makes me think of a storm trooper head a little bit, but I like the way the tentacles turned out. Je suis en train de lire le manga "Princess Jellyfish" en ce moment. C'est l'histoire d'une passionnée de méduses, et du coup j'ai voulu faire une petite méduse aussi. Elle ne ressemble pas à la mascotte du livre, mais c'est voulu, car je voulais créer ma propre bestiole. 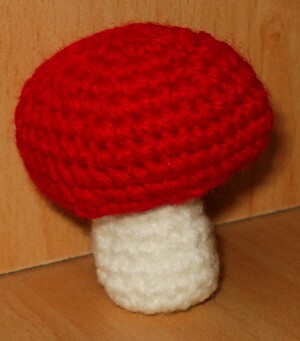 I keep on making cute things in crochet. They are quick, and uplifting, so I love to make them. 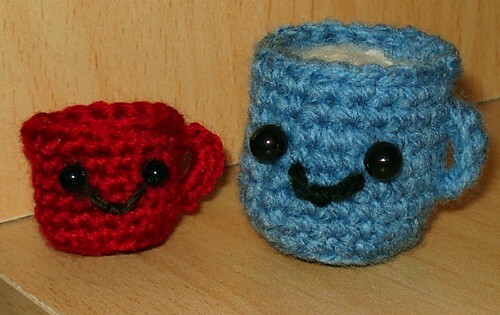 I'm trying things different then animals, and I particularly love the little cups. Je continue à faire des petits mignons en crochet. Ils sont rapides à faire, et ça met un peu de gaieté. Je fais autre chose que des animaux, et j'aime particulièrement les petites tasses. 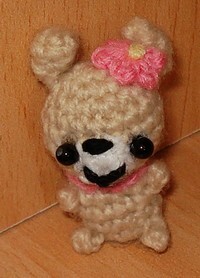 I finally made a little shop over here with my amigurumi patterns. It's a simple click, buy via Paypal and receive the PDF file via email process. Yesterday I had the courage to write 2 new patterns, Paul the English comics guy and the Little Red Elf, so I guess it motivated me to play around with things a little. It's been more than a month.... I didn't craft much, just these two cute amigurumis. I read a lot, mostly off license classics, and I got a new baby, an mpman tablet. I could say I lack time to craft, but that's not it. 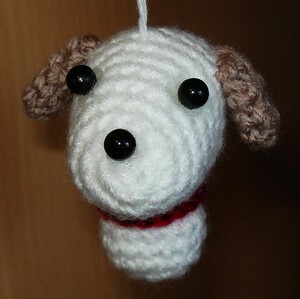 I just feel uninspired, as if I didn't have any strenght to grab a hook and make stuff. So for the moment I won't worry about being in a slump, I will just rest in this weird "is it Spring? Is it Winter?" period. 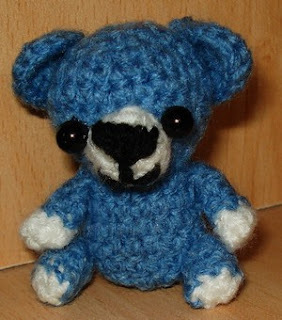 Ca fait plus d'un mois.... je ne fabrique pas grand chose, j'ai juste fait ces deux petits animaux en crochet. Je lis beaucoup, surtout des classiques. Et puis j'ai un nouveau jouet, une tablette internet Mpman. Je pourrais dire que je manque de temps pour le craft, mais ce n'est même pas vrai. Je me sens sans énergie et sans inspiration.